JULY 2013 Breaking new discovery: I challenge everything previously 'accepted' on the Dogon tribes (ref) in Mali in northwest Africa and claim critical detail was intentionally altered for some reason or other. I will present the measurable referenced truth behind a previous established theory. I will be revisiting the 1930 collection of sketches and Dogon quotations and astronomical data references from the earliest explorers that tell a completely different story and blatently contradict the general readers text in the book they published. The Dogon revered their forefathers’ knowledge of their star ancestor heritage. They had a special way to find their ancestors’ star position in the heavens. They showed in their ancient artworks how it was done using symbols and diagrams. Sadly, many of the original rock pictoglyphs are strangely missing... all but one. Were they destroyed by vandals or intentionally hidden, one will never know. The revived secret will place the star map theory on solid ground. The revisited records of the amazing detailed pictoglyph sketches will no longer be hidden, they will be revived and revisited right here. Below we see a preview of the grand unified legend, a combination of all the detail revived... all as one... as the Dogon clearly explained: The Kanaga shows the way to Sigui and Digiteria the place of their ancestors, a depiction that mirrors something once rumoured to be the record of the legendary Hiram Abiff, murdered for holding something secret he was in possession of. Something a few might insist founded the Freemason Blazing Star tradition who coincidently also had many of their own scholars confuse their Blazing Star with Sirius (ref). All will be explored here. 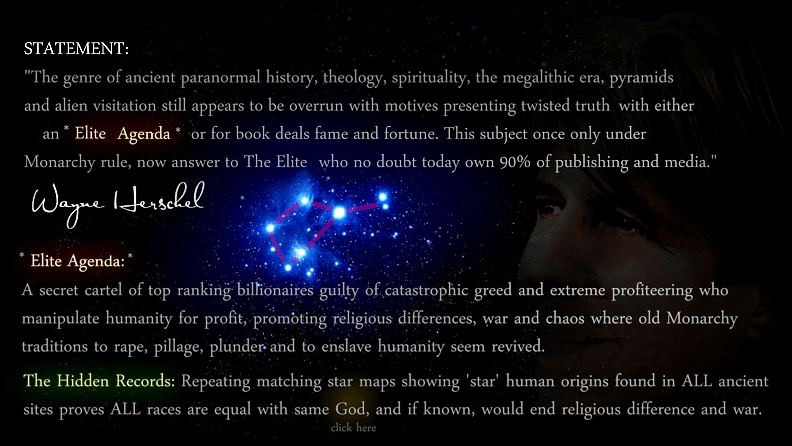 For years I couldn’t quite accept how the so-called Sirius human origin mystery had any solid foundation. Firstly because Sirius had already been proven by astronomy science as non sun-like and confirmed absolutely void of any planets, (ref) and secondly I had found all other ancient civilisations chose another defined star as important. ALL ancient megalithic civilisations according to my globally occurring findings held records of their ancestor genesis depicted in many different ways, but all show that their ancestors’ place of origin was the same single 'solar' star in Taurus. In all the other recurring star maps revealed in my book, the Orion’s Belt alignment to find the special star in Taurus was repeatedly used. 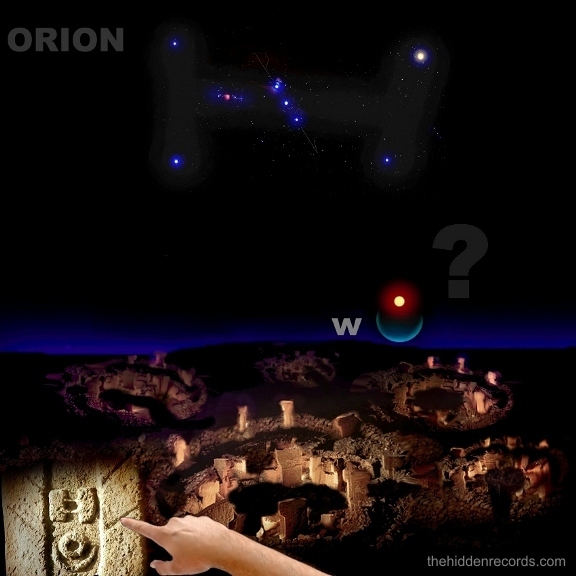 What were the odds against chance ‘The Sirius Mystery’ (a publication by author Robert Temple repeating the 1930 explorers claims) also used Orion’s belt to find another special star… but using Orion's Belt aligning in the opposite direction! It’s a billion to one chance against the odds that the 1930's alignment claim occurring also with Orion’s Belt, although opposite direction. 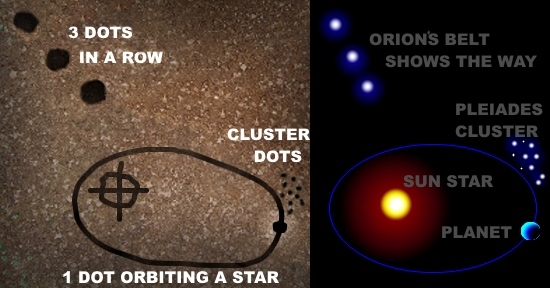 Especially when considering all the millions of other stars to choose in the night sky, the researchers select the only other star also fitting such a unique Orion’s Belt alignment. That’s just one of the obvious glaring clues the previous claim was mistaken. Yes… any professional astronomer will tell an amateur astronomer that to confirm you are looking at Sirius simply look for Orion nearby having its three belt stars aligned with it. So here’s the thing: is it coincidence the 1930s researchers chose one out of a billion stars that fits an 'Orion secret' template? 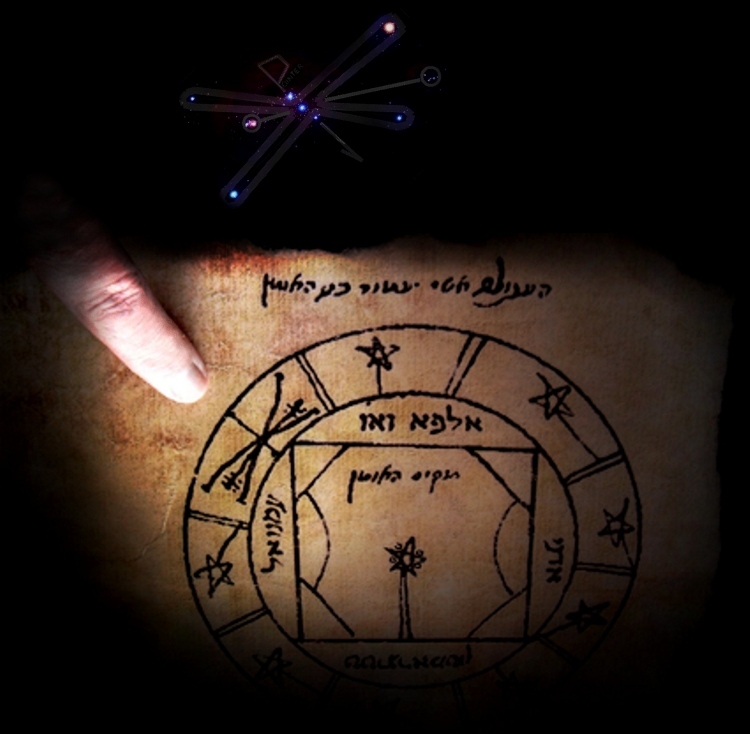 Is it possible the researchers saw and heard the obvious true alignment knowledge of the star secret in depictions and especially when speaking to the Dogon… then perhaps not sure which way to follow in the sky… looked heavenwards and shouted Eureka… it has to be Sirius. our ancestors of the heavens”. The wording here is obviously quite different to what the first Dogon researchers wrote in their paper. It generally concluded in the text that the whole Dogon belief was based on veneration of the star area of Sirius. But the book has sketches that contradict it all! We will now revisit the revived history and measurable references here on this web page and see the obvious. Each of the clues that reference the major detail shown in bold print in the Dogon ‘quotation’ above will be pieced back together. How did researchers confuse this story with Sirius? But that would be following the alignment the wrong way! According to all the other star maps I present, one needs to follow Orion’s Belt the opposite direction like all the other ancient civilisations who followed through towards Taurus, to the real Dogon star that they said was not visible to the naked eye, yet it is known to be part of a group of three and near a cluster of seven stars in this large portion of night sky. 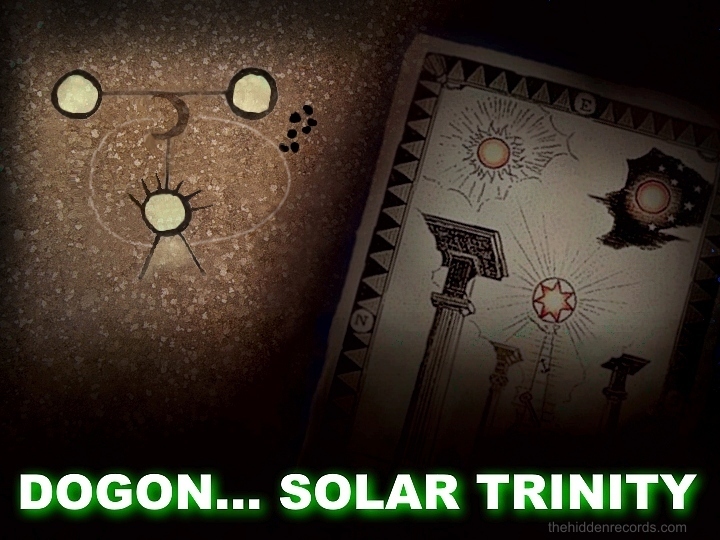 The mistaken Sirius interpretation occurred as a result of the reports of the first two researchers to publish studies on the Dogon in the 1930’s. We will revisit a record of their works here that was later duplicated and expanded upon by author Robert Temple who repeated their Sirius claim and made their story famous. There have aslo been a few other claims for the Dogon mystery who proposed other 'interesting' star correlations for the Dogon star. I have spent years trying to find original photographic record for some of the original stone artwork which would allow him to disprove this Sirius claim with tangible evidence, but sadly we will have to refer to the 1930’s researcher’s meticulous sketch records published in their book for all to review. There is only one rock image left today that was possible to prove. Consider this: All previous researchers have jumped to extreme conclusions believing it was Sirius or Canopus or all sorts of things, with just a few loose threads here and there but no proposal to date other than this account here fits a grand unified global collection where the exact star map detail is repeated not once or twice... but over 30 times. The collection of sketches alone has inspired me to believe in the reality of the accuracy of the sketches because they tell a different story in spite of their off track written text conclusions. So it was worth the work for me to reproduce the lost images as close to the less inspiring black and white sketches. The detail speaks for itself… something more fitting with global measurable repeating records of a star human origin ancient secret. Through the magic of digital rendering on stone, the detail on the 1930’s researcher’s original claims will re-emerge while being discussed. The researcher’s sketches will be brought back to life so to speak rather than displaying messy uninspiring sketches. Let’s revisit the shaman’s words as to how I believe a Dogon elder would have explained the story of the place of their ancestors to the first western researchers. The first line speaks of the Kanaga symbol. The Dogon are more familiar to the world as the figures portrayed in the image on top of this page. They are celebrating their star ancestors wearing ‘Kanaga’ masks and bull masks. Yes, bull masks too… another detail that was over looked. The Kanaga symbol is actually a very strangely recurring symbol found all over the world. In its earliest form it was often presented with two dots on either side of the symbol. The “H” symbol appearance of the Kanaga seems to appear very similar to what is claimed the oldest civilisation of all... Gobekli Tepe (ref). Not only that, its meaning appears to be linked globally also. The Kanaga symbol is one found in the earliest depictions of ancient civilisations all over the world. The image below shows the Kanaga symbol most frequently found with the Dogon tribe in north west Africa. The examples below are of the research of Anthony Peratt who recognised this strange globally common symbol. He interprets it quite differently to what I am about to reveal here. But one has to ask initially is it possible if history insists we were hunters and gatherers and people of primitive civilisations that this symbol appeared by chance all over the world, in separate countries separated by seas? ... (ref). I am convinced that the Kanaga symbol represents Orion. The two dots seem to be Orion’s belt. Some show it more like a lizard with a tail and others more like a man. The latter seems more fitting since myth has Orion as a hunter… either hunting a bull or more logically for me… showing the way with his arrow or three belt stars something sacred near the bull. I was inspired to look at the Dogon while researching another ‘H’ style symbol account of it from ancient records of the Baha’i faith who show a symbol associated in finding their special star which is close to being concluded as yet another substantial case of the star map… (ref). Tradition has always presented the stars of Orion personified as a deity traditionally known as a hunter for him being represented with a bow and arrow. But I insist he was shown with a bow and arrow because he is showing the way to the most sacred place of the sky. Maybe the deity was not hunting but simply showing the way to a sacred star in tune with a forgotten teaching thousands of years old. WHO ELSE SAW ORION AS A COSMIC SIGNPOST? The Orion cross of Christianity is also the Hebrew Solomon Key symbol in the famous Hebrew key of Solomon cipher (seen in a manuscript from the British Library). I claim to have deciphered it by solving the puzzle and identifying Orion and the Pleiades (through assembling the puzzle pieces in its outer ring) showing the way to the Star of David, which is the star of Bethlehem. Both are the same as the Kanaga symbol ref . 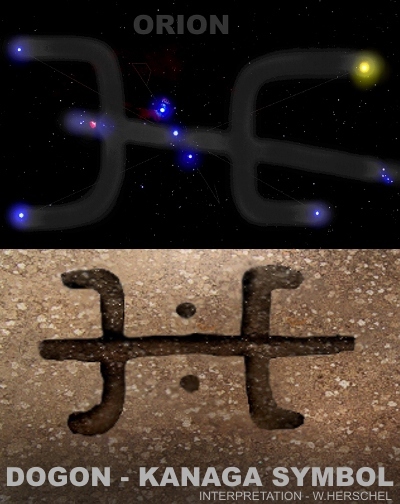 The so-called ground zero beginnings of civilisation itself, the site of Gobekli Tepe in Turkey in the image below also chose to revere the knowledge with an ‘H’ symbol interpretation showing the way to stars in Taurus. 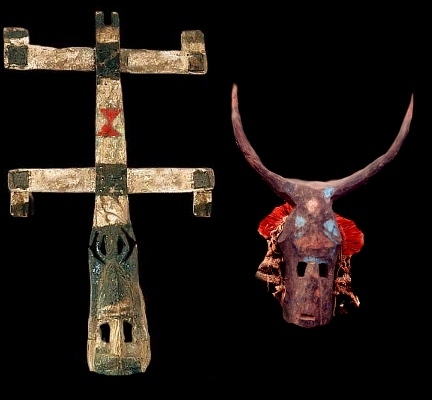 Modern astronomy choses the hourglass symbol as seen on the Dogon mask decoration, which is a variation of the ‘H’ cross. The next landmark and very important clue is that the Dogon’s ultimate star is so tiny it is not even visible at all to the naked eye. This is another fact that would match the star maps recurring globally. 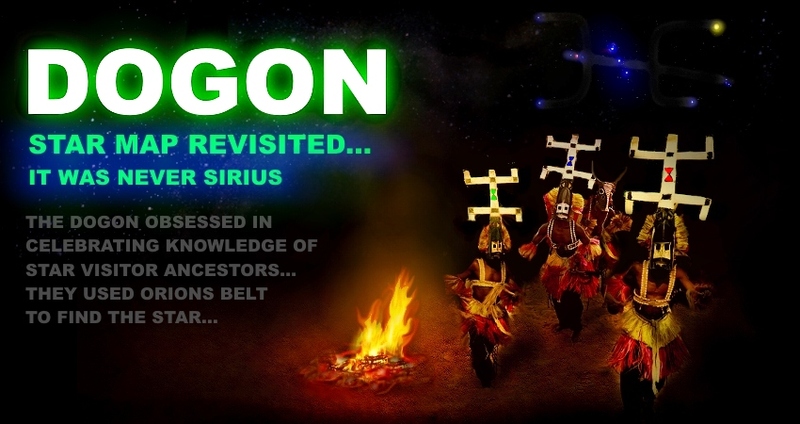 I was certain initially that the Dogon like other ancient civilisations used Orion’s belt as a cosmic signpost to locate their ancestor star called the Sigui Star as we shall both see and reason. If there is a problem with the cashed link then try this link and word search the word "invisible" using ctrl F. ref . This line alone is the strongest evidence in support of my star map theory because the ‘x’ sun-like star that marks the spot in all my star map interpretations is magnitude 14 and invisible to the naked eye. The words here referenced just shows how much confusion there was especially because the primitive uneducated Dogon evolved quite a lot of ritual into their star knowledge. Then later western explorers brainwashed them with further visits insisting this Sirius nonesense is what their ancestors knew, that set off a new Dogon tribal generation believing and agreeing with the altered interpretion. 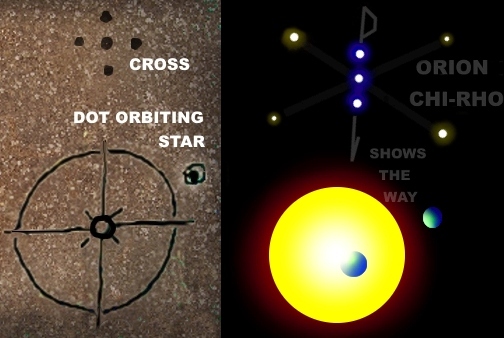 In this first image of ancient Dogon documented evidence (above) from the 1930 sketches and testimony of the Dogon, note the position of a cross placed above a circle of seven stars thought to be the cluster referred to in the Dogon explanation discussed in the previous paragraph. 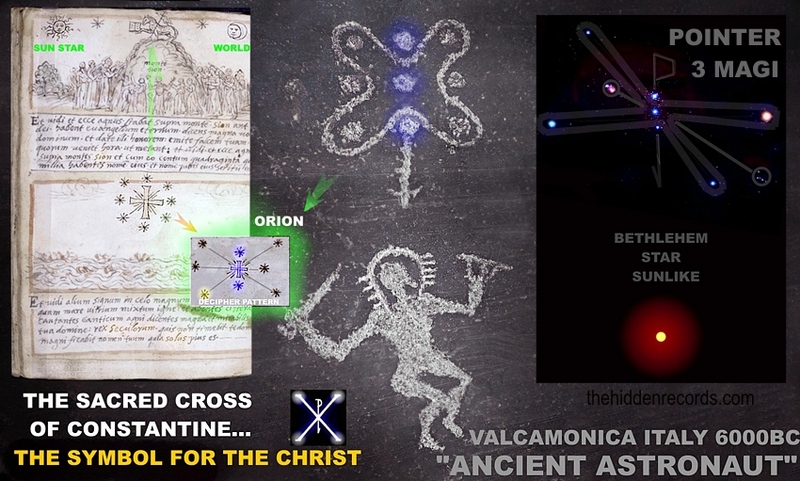 The cross symbol I found is the symbol adapted by the churches for Orion... (ref) clearly here as a cosmic pointer in alignment. It has as the Dogon say, a group of three Sigui stars at its centre. A combination here (image below) of a few Dogon images being revisited and carefully recreated, there is firstly a very common reoccurrence in many sites of three dots depicted in a row. Given the association I make as to their importance as stars, I believe they show the way to what the Dogon called the Sigui star. 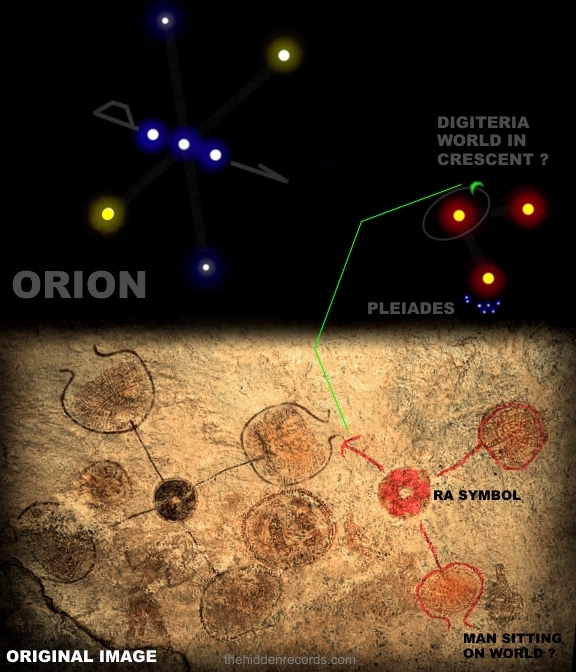 This depiction has what the Dogon describe as their ultimate sacred star, the Sigui star that has a celestial body in orbit around it... an exoplanet world... since their ancestors were of flesh and blood, thus fitting a better interpretation for life as we know it... called Digiteria. The researchers figured the orbital path that was passed down by tradition was proof they were visited by extra-terrestrial beings. I completely concur, BUT the meaning of the out of place, advanced data in an ancient story needs to incorporate an Earth-like planet if the Dogon ‘ancestor’ lineage theory is to fit. The researchers showed the cluster of stars the Dogon depicted in their sketches (ref) but the 80's well known author Robert Temple that followed who made the theory famous chose to omit the cluster completely as it didn’t fit the Sirius model at all. COVER UP... OR BIASED TRADITION? Yes, this orbital sketch alone as seen here is what gave credence to the ancient alien theory for many years… until recently. Now scholars have realised the whole Sirius theory is so completely off track. Its proponents chose to mock the star visitor knowledge aspect too saying the orbit claim was probably a fabrication. Some researchers noted there was extra detail shown inside the Orion star mural speaking of the ancestors in almost and Adam and Eve genesis tone and hence the adaption of it into their sacred rituals and dance ceremonies. We are now working towards a grand finale sketch reproduction of the three Sigui stars showing how all these sketches fit together as one. It will incorporate what the Dogon spoke of explaining this detail with their assurance one Sigui star has close proximity to the star cluster and contains its orbital path of its planet Digiteria. Yes, I have pieced the puzzle together allowing common repeating themes fit because that is what puzzles are meant to encode and hide where only a scholar or learned member of an elite knowledge secret society of the past would be privi to. There simply is no other way to reason the interpretation in another logical fashion. The addition of a beam of light or cosmic ladder is the final piece of the puzzle that speaks the secret. The connection between the Nommo deities of the heavens to Earth is all the depiction needed. There is inclusion of more detail here thanks to the research of Márton Molnár-Göb. Repeated in more than three sketches we have explored already the Dogon insist the orbital path is symbolic of the egg of creation, since its oval. They also insist there was another secondary heavenly body in orbit in all other depictions. So where is it in the image below? Its right here in the image! In the records of the 1930 researchers in the book Le Renard Pale (The Pale Fox), 1965 - page 252, figure 86… the Dogon speak of the sickle here in the depiction below… a crescent shaped knife used in ritual of circumcision which they celebrate with ancestor star knowledge. This word alone speaks volumes. Was this the sketch that 1930s researchers Griaule and Dieterlen saw and was it possible they instructed on conditions on what they show in their research before or after seeing the depiction that was sketched? Is there a chance the two were invited to be members of the Masonic fraternity that followed the same confused tradition that the Blazing star of the First Degree was Sirius? Chose the google books option... Pathways of Power by Eric Robert Wolf page 72 first two paragraphs. 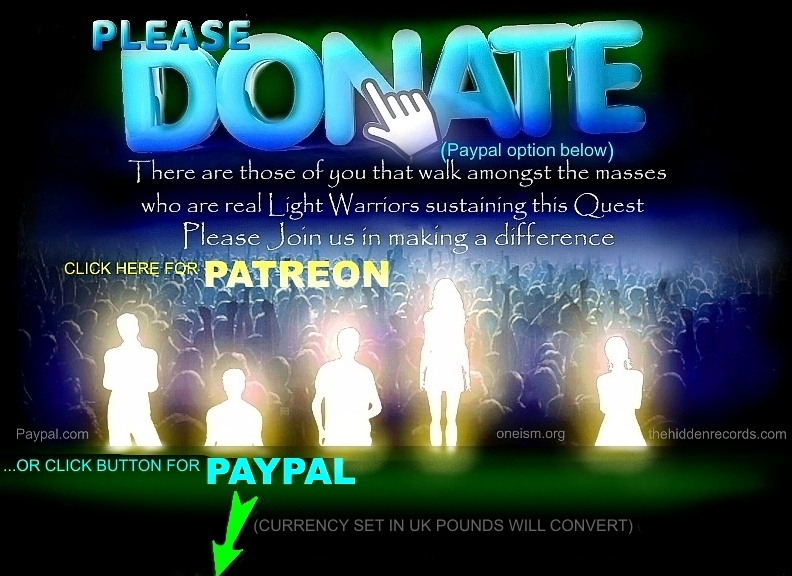 This is the very same organisation who is funding another modern day UFO disclosure project, one also titled Sirius, (coincidence?) that just launched a multimillion dollar profit maker movie promising proof of an alien body proof and free energy device. It all amounted to false promises and hearsay with no scholar papers or academic documents as conclusive proof that the Rockefeller funding could have made possible. Proof of the elite funding is on wikipedia. Scroll down on the Rockefeller paper where it has the title UFO, last line. But the 1920's researchers 'altered' presentation is not what made the Dogon 'Sirius' claim become famous. Another famous Freemason who published the best selling book "The Sirius Mystery" ... Robert Temple who would no doubt also have been sworn to the same oath of tradition to honor traditional interpretation of the ultimate star as Sirius. Temple has said he was brought up in a very influential historical masonic family and some unproven accounts say he is a 33 degree Grand Master. One can imagine most reading this will shout out cover up!... they intentionally lied! But perhaps its a little more simple than that as to why powerful people would want to conclude it was Sirius in the Dogon mystery. Many Masons have told me that this Sun star secret near Pleiades has been obviously hidden or forgotten some time very early in Freemasonry. Far back in history some high orders perhaps from the monarchy highest orders decided it was important to make the star map secret. Since this star near the Pleiades is venerated by virtually ancient people of all race and tradition all over the world, it proves our ancestors were all equal and sacred. We all have a connection having the same cosmic origins. Thus all bloodlines are just as sacred and this could mean something terrible for all great monarchy type empires. If all race, tribe and nation are equal and sacred then the profits of war and chaos could be lost for competing empires. War is obviously then based on lies and false propogandas claiming each nation is different and not chosen by God. If the masses knew the truth of the hidden records then it risks the end of the profiteering spoils of war and evolve towards a far less profitable era of peace. So the Monarchy based empires perhaps a long time ago chose to turn Orion's Belt alignment in the opposite direction to the brightest star in the sky. Perhaps that was the idea to keep eyes away from the truth. Since most Freemason societies are more interested in gentleman fraternities involved with charity and goodwill among a brotherhood membership, one cannot legally catagorize the society one way or the other. One however will see the obvious how it was in the past. Many say it is very different today. Some will say that is untrue. 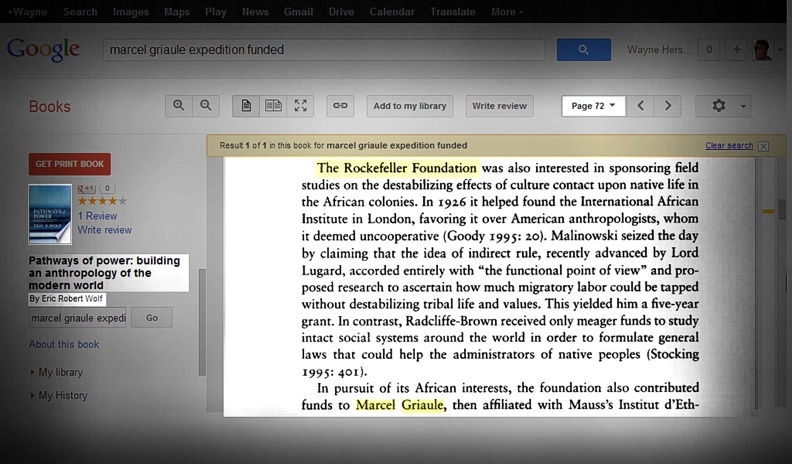 Rockefeller was a famous Freemason as mentioned in many historical records and this one here, quoting famous Freemason quotes... second paragraph... ...(ref), sponsored the first expedition to 'hit gold' and find proof his long period of Sirius ancestor star belief was real, but also the author that made it famous. Robert Temple was probably just like Rockefeller and more inclined to believe the claims of his historical own family and lodge brothers conclusions it was Sirius too. So rather than it be the case of continuing some strict plan by those who presented this Sirius error, it probably all amounts to limited access to records and their deep passionate belief in Sirius was how the truth became hidden. Combination image rendered with second source Le Renard Pale (The Pale Fox), 1965 - page 252, figure 86 shown also as Vesica Pisces sacred feminine 'womb' area of the heavens. ref . This story here on its own without the references taken into account will read like a worthless hard to follow crazy story, which is why all the links have been incorporated for you to do your own important cross referencing. As far as reasoning the old theory of Sirius fitting the strange records, one has to accept that our technology has now reached a level of development where we can detect Earth-like planets as far away as 20 times the distance of Sirius. But especially because Sirius is so close to us as one of our closest next door neighbours. The star shows a tiny wobble typical for its visible tiny binary companion and one hundred percent confirmation of not even the smallest planet (ref). There is one more really shocking but quite exciting last piece of the puzzle that buries the failed Sirius claim once and for all showing the explorers knew the truth. When I first read the words that Márton Molnár-Göb kindly translated from his Hungarian version of the book for me of the Dogon explaining one tiny little forgotten thing… I nearly fell of my chair. It was in the book by Marcel Griaule and his student Germaine Dieterlen, Le Renard Pale (The Pale Fox), 1965 - page 326, figure 109. It must have been a forgotten piece of their research documenting one of the biggest ceremonies of the Dogon. “This ceremony (Sigo Tolo star ceremony) signifies the conjunction of the Sun and Sirius”. The researchers either made a massive error forgetting about erasing these words conveyed by the Dogon when concluding the Sirius hypothesis for the Sigui star or they intentionally left it in for astronomers and their pride to show "they knew the truth and were forced to lie". It concludes firstly Sirius is not the Sigo Tolo (Sigui star). By definition firstly Sirius is so far from the path of the sun that it is impossible any time in history to be near sunrise. 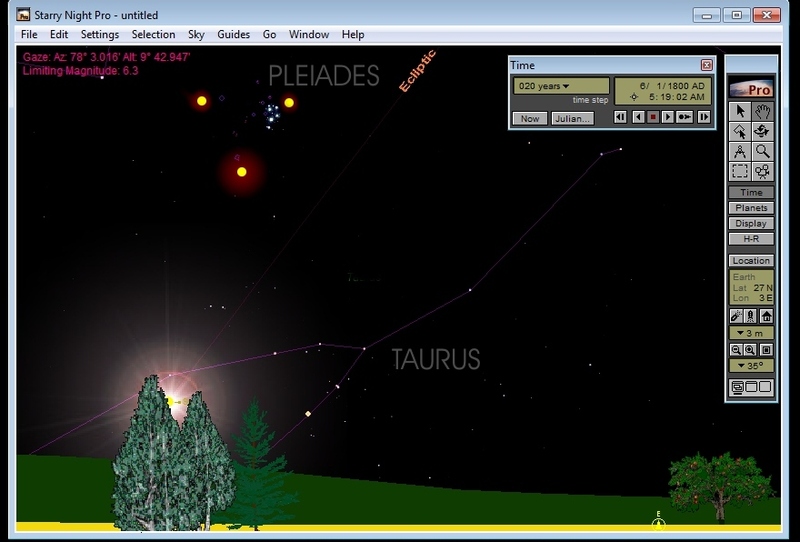 Sirius is a full 40 degrees of arc away from the closest crossing of the sun on the ecliptic. 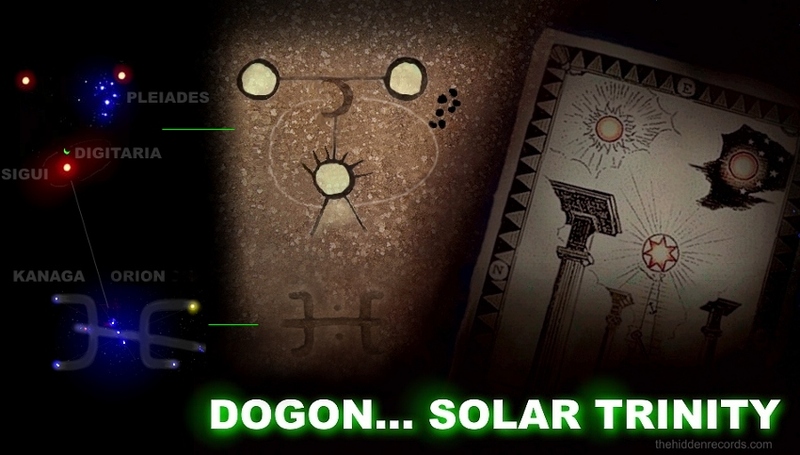 The Dogon star deity/ancestor worship enigna on its own having Sun systems near the Pleiades is an inconclusive theory just as one single studied account. It needs to be placed into context with all the other identical matching ancient civilisations.